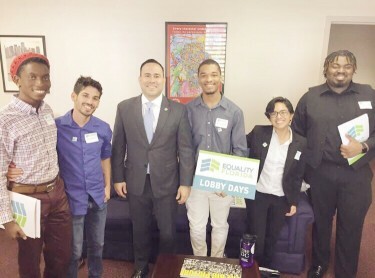 As an intern for the HIV Advocacy Project with Equality Florida, I had the opportunity to experience advocacy and public health on a new level. 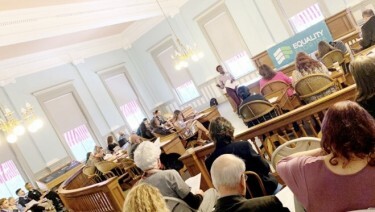 In the lead up to Lobby Days 2019, my main duty was to recruit community advocates living with HIV to join us in the Capitol, to coordinate attendance with other organizations like SERO Project, and to train community advocates on the HIV legislation currently moving through both the house and senate. Coordinating 17 advocates from across the state was a logistics challenge that really put into perspective the concepts of effective organization and communication. When I arrived at the Capitol, the perfectly polished marble and picture-covered walls reminded me of the importance and history of the building and it filled me with pride. For a moment I felt like Ms. Annalise Keating in my own version of “How to Get Away with Murder” holding my head high ready to present my case. I was uniquely placed in a leadership position, and having a supportive team made all the difference in my success. One of my main duties during the event was to train all participant community activists on HIV and the importance of using inclusive language when speaking about HIV with legislators, especially now that there are two HIV bills moving in the House and Senate (HB 79 & SB 846). The HIV Modernization bills by Rep. Nick Duran and Sen. Jason Pizzo aim to modernize HIV-specific laws in the state of Florida and align them to current science. As of right now, vulnerable populations face many barriers to accessing services and living a healthy life. One thing we can all agree on is that we all want the same things in life, to be loved, respected, and feel equal. The reality and impact of our work became unbearably clear when one of our community participants living with HIV realized the extent of the law. Her tears rolled at her fear of being arrested for disclosing her status to lawmakers; her concern was real. We had to reassure her that would not be the case. My purpose was reaffirmed, these laws have a hugely detrimental impact in our community and the effort to change them started right there. Primarily my day-to-day work centers in Public Health/Prevention from a community-based level. Having the opportunity during Lobby Days to sit down with lawmakers, educate them, and share the stories of our participants felt monumental. Our advocates came from different walks of life, different ages, different races, some were part of the LGBTQ community and some were not. Similarly, both representatives and senators expressed some familiarity with HIV, and those who did not were open to listening to those personal stories shared. Ultimately there was a sense of mutual respect fostered through those conversations. For two days our teams of advocates of people living with HIV walked miles of hallways meeting with legislators and their aides, and when it was all over, we sat to eat one last meal together. During lunch, the loud voices of over 100 community advocates filled the room with a sense of accomplishment and newfound purpose. Looking around the crowd you could see that a movement was being made. This experience stressed the importance of health advocacy especially for those who are connected to vulnerable communities. I can attest that having this platform emphasizes the importance of representation and that making a difference in the world does not belong to a special group, anyone can do it regardless of what they look like or who they are at their core. I truly believe that if your passion for change is divinely instilled in you, and even when you are unsure of where your passions lie, you can successfully carry out your purpose in life. I cannot wait to see new faces in the Capitol halls next year during Lobby Days. I’m sure this will become a yearly tradition for me from now on. Terrell Jackson is Equality Florida’s HIV Advocacy Project Intern. He is a graduate research student at the University of South Florida, holds a FL Certificate as HIV Tester and Personalized Cognitive Counselor, and also coordinates PrEP navigation at JASMYN in Jacksonville. For more information, you can reach him at [email protected].